In the 1930s the Canadian Banker celebrated contemporary Canadian bank architecture with the publication of articles on the buildings of the Dominion Bank and the Banks of Commerce, Montreal and Toronto. Many of the buildings analyzed constituted neo-classical [*] examples of pre-World War I corporate architectural styles. The Canadian Banker commemorated success, not failure, for the banks mentioned above had survived intact during the mergers of the 1920s. Other less successful financial groups, too, had developed elements of a corporate architectural identity but had been absorbed by stronger banks. 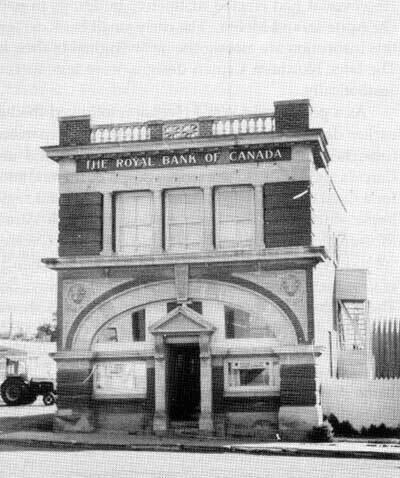 Two of these institutions, the Northern Crown Bank and Union Bank were Western-oriented and Winnipeg-based. Prior to their absorption by the Royal Bank, they projected their own brands of architecture across the prairies and to a number of Canada’s major metropolitan centres. At the turn of the century, before Canada’s financial institutions routinely constructed buildings along neo-classical lines, the Union Bank had already established an architectural presence in Western Canada. However, the buildings of the Union Bank like those of other banks had differed widely from one another and failed to project a company image. Figure 1. Union Bank, Neepawa, 1898. Source: “Banks and Banking”, The Colonist, vol. 12, no. 8, January 1898. Toronto architects Darling and Pearson’s new 1905 building in Winnipeg served as a model for many of the Union Bank’s later structures. When the construction announcement was made on 2 August 1902,  Darling and Pearson had already established a reputation as important bank architects. In Eastern Canada, this firm and their predecessors Darling and Curry had prepared the design for a number of bank buildings. One of these, the 1885 Bank of Montreal in Toronto, a highly-adorned neo-classical building, was widely acclaimed for its interior layout. 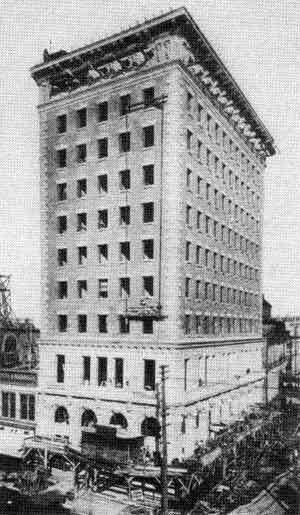 By the time of the announcement of the new Union Bank building Darling and Pearson were also an established presence in Winnipeg. 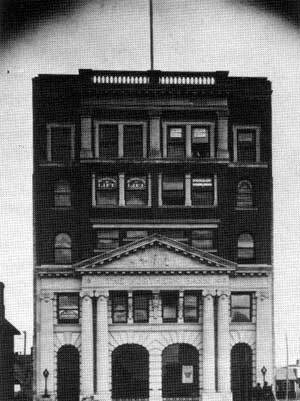 Their Dominion Bank, constructed in 1898 at the corner of Main and McDermot, flaunted a highly eclectic neo-classical facade. Winnipeg’s first Canadian Bank of Commerce across the street was another Darling and Pearson creation. Completed in 1900 and possessing a structural steel frame and a highly-adorned neo-classical facade and interior, this edifice represented the state of the art in turn of the century commercial building. Their previous successes made Darling and Pearson a logical choice for designing the Union Bank’s Winnipeg showcase. Exterior style set Winnipeg’s Union Bank apart from the structures of many competing financial institutions. At street level, the colonnade favoured by other banks was replaced by a two storey high Romanesque base topped by a decorative balustrade and an unadorned third floor the same size as the base. Minor ornamentation adorned the upper office floors. Constructed of ochre brick, the outer walls featured radiating voussoirs above each window. At its upper level the structure received rather unusual decorative treatment. Darling and Pearson specified a decorative Sullivanesque terra cotta frieze with porthole windows and an enormous overhanging cornice to supplant the more common pilastered frieze. The stylistic ingredients of this building comprised of the Romanesque facade, Sullivanesque frieze and overhanding cornice separated the Union Bank from its Winnipeg competition (with the exception of the Merchants Bank) and constituted a model for other structures of this institution. [See Figure 2.] In overall effect, the building was distinguishable from other banks as a result of its unadorned and column-free street level facade and its extensive ornamentation just below roof level. Figure 2. Union Bank, Winnipeg. Under construction, 20 July 1904. Source: Cyclopedia of Architecture, Carpentry, Building (Chicago: American Technical Society, 1909). Figure 3. 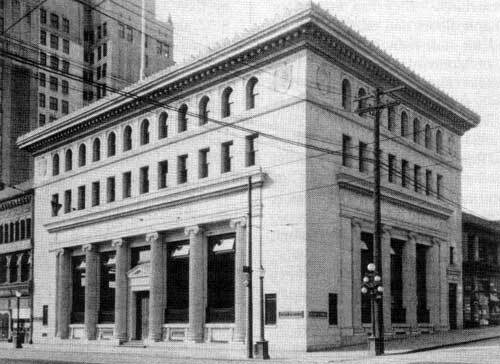 Union Bank, Vancouver, British Columbia, post 1925. Note that the building was acquired by the Bank of Toronto after the absorption of the Union Bank by the Royal in 1925. Source: Vancouver Public Library, Photo VPL 22362. By 1920, a sizeable number of Union Bank buildings could be distinguished from other financial institutions by their lack of colonades and pediments. Corporate headquarters in Winnipeg, regional offices in Ottawa and Toronto and branches in a variety of prairie centres shared several elements of a common architecture. Unlike the Union Bank, which was a transplanted Eastern Canadian institution, the Northern Crown Bank was established by Western Canadian businessmen. First known as the Northern Bank, it opened for business in 1905 and boasted among its directors James Ashdown, Winnipeg’s leading wholesaler, Sir Daniel McMillan, the Lieutenant-Governor of Manitoba, and Manitoba Premier Rodmond P. Roblin. From its Winnipeg base, the Northern Bank quickly expanded into a number of Manitoba and Saskatchewan centres. Soon its directors turned their eyes eastward. The Crown Bank, a Toronto financial concern founded in 1903 by Hamilton manufacturer Edward Gurney, was absorbed by the Northern in 1908. The enlarged institution became known as the Northern Crown Bank. In contrast to the Union Bank, Northern Crown buildings shared few elements of a corporate architecture. To lure clients from the longer-established banks, the Northern experimented with a variety of styles—sometimes on the same building. The flagship building in Winnipeg reflected this policy. Rather than constructing a corporate headquarters, in 1905 the Northern Bank purchased an existing structure and expanded it by two storeys. In enlarged form, its five storey Winnipeg structure reflected the garrishness and flamboyance of late-nineteenth century neo-classicism in the first three storeys, but also revealed the more subdued ornamentation of the twentieth in the upper two. [See Figure 4.] In 1910, the bank called upon Winnipeg architect George W. Northwood to expand and re-model this structure. (Northwood had carried out the original re-modelling and expansion). To meet the bank’s growing business needs, he prepared plans for a twenty by one hundred feet addition. In the interior he added the usual touches expected by the banking public—modern elevators, a marble floor, and bronze tellers’ cages. But the greatest transformation occurred on the exterior. The highly-adorned neo-classical facade gave way to a reserved and unornamented cream-coloured terra cotta exterior. The Northern Crown headquarters became the only early twentieth century Canadian bank headquarters to be clothed in two consecutive forms of neo-classicism. Figure 4. Northern Bank, Winnipeg, 1905. Source: Manitoba Free Press, Building Number, November 1905. Figure 5. Northern Bank, Regina, Saskatchewan, no date. Source: Saskatchewan Archives Board, Regina, Chamber of Commerce Album, page 5. Like its competitor the Union Bank, the Northern Crown expanded to rural and suburban areas. Among places selected for branches were Red Deer, Alberta; Qu’Appelle and Manor, Saskatchewan; Melita and Beausejour, Manitoba; and at least one suburban Winnipeg location. While the Northern designed its branches in a variety of styles, the identical buildings at Qu’Appelle and Melita displayed some of the most distinctive small bank architecture produced in early twentieth century Canada. 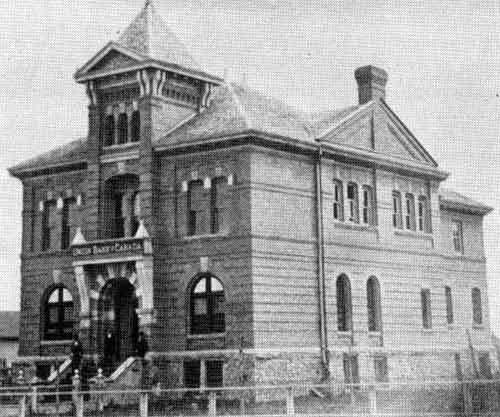 Announced in 1906 and probably an effort of the firm of Blair and Northwood, the Qu’Appelle branch bore a resemblance to the Regina regional office. Extending two storeys in height, it shared with Regina a small pediment, second storey stonework in the image of pilasters, and upper floor vertical windows. But here the similarities ended. Instead of a colonnade the architects borrowed from the work of Louis Sullivan and specified a grand arch extending the width of the entire main floor flanked by two buffalo head ornaments. Topped by a second storey entablature and highly decorative balustrade, the building conveyed an image of strength and stability. [See Figure 6.] The blend of neo-classical and Sullivanesque elements with the buffalo head symbol suggests that the Northern sought to establish a corporate image based on an identification with the Prairie West and architectural innovation, but with a respect for conservative design. Figure 6. Northern Crown Bank, Melita, Manitoba, 1967. Source: Archives of Manitoba, Melita-1. Figure 7. 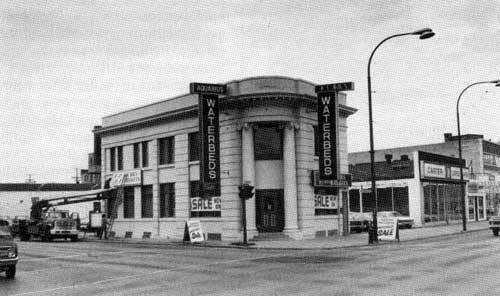 Northern Crown Bank, Portage and Sherbrook Streets, Winnipeg, circa 1979, now demolished. Source: Photo by author, circa 1979. At the height of its prosperity the Northern Crown Bank failed to produce a cohesive corporate architecture. However, it had erected distinctive buildings in Regina, Qu’Appelle, and Melita. The early small bank designs of this institution are among the most original of their kind. The later Northern Crown designs were less successful aesthetically. The Union and Northern Crown Banks left behind an interesting architectural legacy. To compete with the larger banks, both Winnipeg-based institutions erected structures which differed in some respects from the period’s accepted colonnaded neo-classicism. Buildings of the Union Bank still stand in Ottawa and Winnipeg while the Northern Crown’s banks in Qu’Appelle and Melita remain local landmarks. Neo-Classical: Buildings based on Greek and Roman architectural orders which were constructed in the late nineteenth century and the first quarter of the twentieth. These buildings were distinguished by pedimented porticos flanked by a series of columns. Romanesque: A transitional style between Roman and Gothic which enjoyed a revival in the nineteenth century. It was based on the rounded arch. Door openings and windows are topped by semi-circular arches. Sullivanesque: A style based upon the architecture of Louis Sullivan (b. 1856, d. 1924). Facades frequently possess huge rounded openings. Relief ornamentation can appear almost anywhere including below the cornice (decorative frieze). Tudor Revival: A style based on the architecture of fifteenth and sixteenth century England. The style featured steep-sided gables and bay windows. Sources: John J. G. Blumenson, Identifying American Architecture (Nashville: American Association for State and Local History, 1977); Marcus Whiffen, American Architecture Since 1780—A Guide to the Styles (Cambridge, Massachusetts: The MIT Press, 1969). The author wishes to thank Randy R. Rostecki for his useful comments and suggestions. 1. See C. P. Liebich, “The Architecture of Bank of Montreal Buildings,” Canadian Banker, vol. 44, no. 1, October, 1936; Walter R. Blackwell, “Bank Architecture and the Bank of Toronto,” Canadian Banker, vol. 45, no. 1, October, 1937; James Nicholl, “Buildings of the Canadian Bank of Commerce,” Canadian Banker, vol. 45, no. 2, January, 1938; John M. Lyle, “Dominion Bank Architecture,” Canadian Banker, vol. 45, no. 3, April, 1938. 2. The ideas presented in this paragraph have been developed in David Spector, Monuments to Finance—Three Winnipeg Banks, vol. 1 (Winnipeg: City of Winnipeg Historical Buildings Committee, December, 1980), pp. 3-12; Monuments to Finance—Early Bank Architecture in Winnipeg, vol. 2, (Winnipeg: City of Winnipeg Historical Buildings Committee, 1982), pp. 3-15. 3. See David Spector, Monuments to Finance, vol. 2, p. 7. 4. See Ronald Rudin, Banking en francais —The French Banks of Quebec, 1835-1925 (Toronto: University of Toronto Press, 1985), p. 75. 5. Spector, vol. 2, p. 7. 7. “Banks and Banking,” The Colonist, (Winnipeg, Manitoba), vol. 12, no. 8, January 1898, unpaginated. 8. Neepawa - An Architectural Walking Tour, (Winnipeg: Manitoba Culture, Heritage & Recreation, 1987), unpaginated. 9. “Banks and Banking”; “Union Bank of Canada,” Carberry Express, 10 April 1902. 10. “New Sky-Scraper for Main Street,” Winnipeg Morning Telegram, 2 August 1902. 11. “Bank of Montreal-Toronto Branch,” The Monetary Times, 24 December 1886, pp. 728-29. 12. See Spector, vol. 2, pp. 27-28. 13. “Palatial Premises - Magnificent New Building of Canadian Bank of Commerce in Winnipeg the Most Complete in the Dominion,” Manitoba Free Press, 25 October 1900. 14. See Spector, vol. 2, pp. 33-35. 17. “Bank Designed in Glazed Terra Cotta,” Construction (Toronto, Ontario), January, 1912, pp. 62-64. 18. “New Union Bank Building, Ottawa,” Construction, August, 1919, pp. 229-32. 20. David Spector, “Edmonton Bank Architecture, The Neo-Classical Age, 1904-1914,” Alberta History, vol. 43, no. 1 (Winter, 1986), pp. 16-18; “New Union Bank, Vancouver, B.C.” Construction, July, 1921, pp. 206-09. 21. See Saskatchewan Archives Board, Regina, Photograph Collection - Union Bank, Indian Head (RB-105), Union Bank, Humboldt (RA-160), Union Bank, Kindersley (RA 9376-9); Glenbow Foundation Archives, Calgary, Photograph Collection- Union Bank, Hanna (NA-3596-167); David Spector, vol. 2, pp. 62-65; 80-81. 22. Saskatchewan Archives Board, Regina, Royal Bank of Canada. Architectural Drawings, Union Bank of Canada, Yorkton, May, 1906. 23. See Minnedosa - Valley Views (Minnedosa: Centennial Committee, 1982), pp. 36-37; Glenbow Foundation Archives, Photograph Collection, Union Bank, Wainwright (NA-3774-175). 24. “New Bank being Formed,” Toronto Star, 18 April 1903; “Two Strong Banks Welded,” Winnipeg Morning Telegram, 6 January 1908. 25. “Another Bank being Formed,” Toronto Star, 18 April 1903; “Two Strong Banks Welded,” Winnipeg Morning Telegram, 6 January 1908. 26. 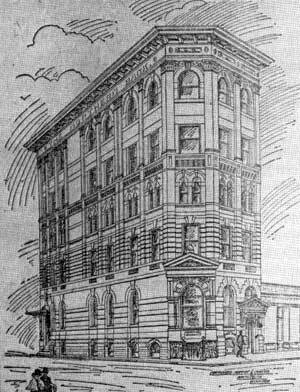 “Head Office of the Northern Bank,” Winnipeg Telegram, 21 August 1905. 27. “The Northern Crown Bank,” Winnipeg Telegram, 11 October 1910. 28. See “Third of Million Month’s Buildings,” Regina Standard, 5 September 1906; “Architects and Engineers,” Winnipeg Saturday Post, 8 June 1912; “G. W. Northwood City Architect,” Winnipeg Tribune, 15 December 1959 in Manitoba Legislative Library Scrapbook, B11, p. 264. 30. “Elevation of Northern Bank at South Qu’Appelle,” Winnipeg Telegram, 11 August 1906. 31. Provincial Archives of Manitoba. Photograph Collection - N4972, Beausejour - Northern Crown Bank, c. 1913. 32. See Spector, vol. 2, pp. 91-93. 33. Glenbow Foundation Archives, Calgary, Photograph Collection, NA-3774-148, Photograph of Northern Crown Bank, Red Deer, Alberta, pre 1918. 34. “A Bank Merger?” The Monetary Times, 14 January 1916, p. 9; “Royal Bank Absorbs Northern Crown,” The Monetary Times, 15 March 1918, pp. 25-26. 35. Spector, vol. 2, p. 36.